I’ve been making the case that gold is on the threshold of a sustained bull market. In a nutshell, my case centers on China. In the past decade and a half, China has surpassed the U.S. as the biggest global trader. After the U.S. financial crisis of 2008, like the rest of the world, China is wary of the dollar. It wants an international monetary system that isn’t dependent on the dollar, or any paper currency for that matter. China has a deep faith in gold, and has been accumulating gold. It anticipates bringing about a monetary system in which gold will be an integral part. Implementation of such a system will be one reason gold will soar. Another will be growing resource scarcities. These, too, relate to China’s rise as the country continues to spur creation of huge amounts of infrastructure throughout the East. A skeptic recently asked me a good question that some of you may share: If China has been buying up so much gold, why haven’t gold prices been shooting up already? Before I answer the question, keep in mind a brief summary of gold’s action in the last 15 years. 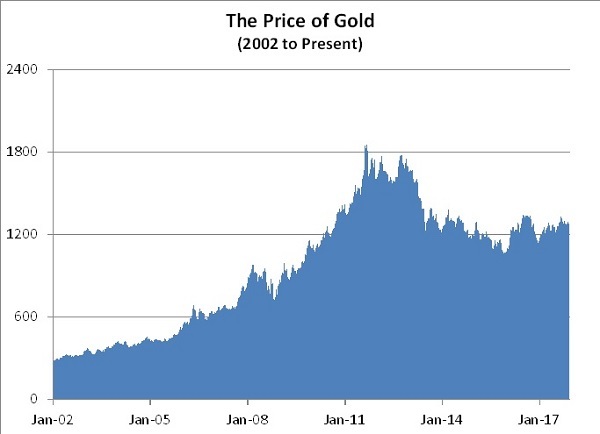 In 2002, gold was trading in the mid $200s. It made a high of $1,920 in 2011 and then corrected by about 15 percent. It continued to trade at around $1,600 in 2012 and the first quarter of 2013. Then two major falls in 2013 left gold near $1,200. This is around the midpoint of the $1,050-$1,400 trading range that has persisted since. I see two factors accounting for gold stagnating in the last five years. First, in 2013, the Bank for International Settlements (BIS) issued a set of rules designed to prevent the kind of financial debacle that had rocked the world in 2008. The rules mandated that banks hold a healthy percentage of liquid assets, and they listed the assets that would count towards this quota. But notably, and against all expectations, they omitted gold – even though gold had outperformed the dollar, U.S. bonds, and other assets during the crash. This was a remarkable omission. It’s not a stretch to interpret the BIS’s action as a deliberate effort to protect the dollar’s position as the world’s reserve currency, especially given some pushback against the dollar that had emerged after 2008. Specifically, in 2009, the head of the People’s Bank of China had urged international financial institutions to consider dropping the dollar. He suggested replacing it with some combination of SDRs and gold. The idea spread, and perhaps the BIS felt it needed to shoot it down. Regardless of its motive, leaving gold off the menu of liquid assets was one big reason for the gold price drop. Yes, there have been gains. But in 2014, the Census Bureau threw out its old methodology and adopted another system to calculate real median income. The problem is that it failed to apply its new techniques to past data, so it failed to compare oranges with oranges. When you apply the new rules to pre-2014 data, it turns out that living standards are far short of previous highs in the last century as well as the 2007 peak. Other statistics further support the idea that U.S. living standards have been losing ground. To cite just two, home ownership has been slipping relative to the numbers of people who rent. And a rising percentage of car purchases are of used, not new, cars. The tie-in to gold, and to why gold prices haven’t yet taken off, is that sluggish economic growth has meant sluggish growth in commodity prices. While some measures of commodity prices have equaled or topped 2008 levels, so far virtually all indexes remain shy of 2011 all-time highs. That’s relevant because gold is closely linked to prices in commodities. Pre-2008, when commodities were flying, gold was soaring even higher. And the gain in gold between 2002 and 2011, when gold and commodities both made tops, was twice the gains made by major commodity indexes. That performance echoed the 1970s, when as commodities soared, gold rose by a lot more. This makes sense. The tendency of gold to outperform soaring commodities is a logical reaction to potential commodity scarcities that higher commodity prices signal. Given the above two factors, it’s not surprising that gold has flatlined despite heavy Chinese buying. The world produces about 3,000 tonnes of gold a year. It’s estimated that China purchases somewhere between 1,500 and 2,000 tonnes a year. Gold has few industrial uses, meaning it doesn’t get used up and is never scarce for economic reasons. It’s likely that under the conditions that have prevailed since 2011, the Chinese could purchase as much as 4,000 tonnes a year without affecting prices much, as holders of the metal would likely be willing to sell. Now, you may ask, why will anything really change? The U.S. still has tons of resources and makes lots of things. We’re not going anywhere. So why can’t the dollar just keep on going as the world’s major reserve currency? To see why things are changing you must see how much China’s emergence threatens to upend existing international norms. The world really did start anew at the end of 2001 when China entered the World Trade Organization (WTO). China abruptly gained the ability for immensely larger trade with other countries. This has redefined the world’s economy. By an ever-growing margin China has replaced the U.S. as the world’s largest trader (imports plus exports). Equally important, if you measure a country’s GDP in international dollars, China has surpassed the U.S. as the world’s biggest economy and continues to widen its lead. About two centuries of Western (European and American) economic leadership have been toppled in the first decade and half of this century. An additional relevant comparison is that between 1990 and 1994, about 63 percent of world trade took place among developed countries. Over the past five years, more than 63 percent of world trade involves developing nations, with China by far the most important contributor. Clearly economic trends in the developing world have become far more important than trends in the developed world. The point is that China holds more and more of the cards. It will have an increasing ability to get its way and get what it wants, at a minimum within the Eastern part of the world, which will be accounting for the lion’s share of world growth. And what China wants is a revamped monetary system that downplays the dollar and emphasizes gold. It will be exerting pressure to achieve this. We expect its efforts will succeed. Elevating gold as a currency will, in effect, undo what the BIS did to gold in 2013. At the same time, we expect that commodities have made a bottom and will be rising, perhaps sharply. The factors that have kept gold listless will now start to propel gold dramatically higher. I could note that while Warren Buffett says America has been around for 250 years, China has been around for 3,000 years and in all but 2 of those 30 centuries has been the world’s top economy. And I could discuss how a yuan/gold-back Eastern oil contract will likely be launched in the very near future. This will be a precursor to other commodities being traded in a gold-backed yuan – the initial steps to a new monetary system. Above all, I could again note that China sits at the center of the developing world, an aggregation of about 6.5 billion people whose per capita GDP is one-fifth that of the higher income countries. China intends to reach levels closer to Western standards of living, and to take much of the developing world along with it. That goal implies a nearly unimaginable level of future demand for commodities. No wonder China has made sure it controls a vast array of critical commodities, from cobalt to lithium to heavy rare earths. It also has massive stockpiles of others, including oil, silver, and copper. And against most Wall Street expectations, it continues to add to these stockpiles. In sum, the conditions for rising commodities and a new monetary system are falling into place, and the countdown to a massive breakout in gold has begun.